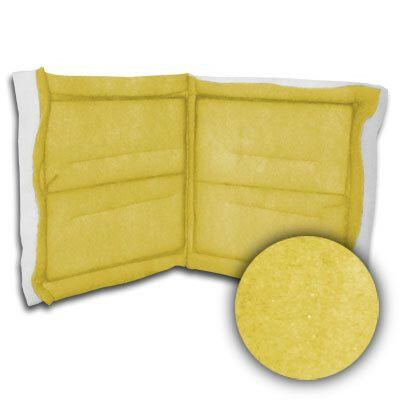 20x48x1 Sure-Seal Poly Ring Link Economy 4 PLY Filter | Air Filters, Inc.
Air Filters Incorporated™ Sure-Seal™ 20x48x1 4-Ply MERV 8 Poly Ring Link are made with the highest quality, yellow tackified 100% virgin polyester media that is thermally sealed around a heavy duty internal wire frame. 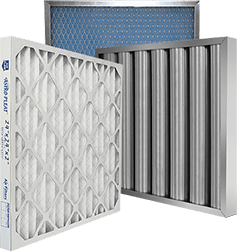 Prefilters- High dust holding capacity and low resistance make these filters an excellent choice for prefilters to extend he life of high efficiency final filters. Primary Filters- They can also be used as the primary filter in single stage systems to protect coils and mechanical equipment. Second Stage Filters- Our self-supported filters are used as the second stage in three stage filtration systems. Paint Spray Booths- Multiple models are used as the primary and secondary filter in paint booth overspray collection systems. From an air-entering filter for paint booths to upgrading a fiberglass disposable panel installation, the poly ring air filter is perfect for a number of filtration applications. The self-gasketing feature of poly ring air filters prevent dirt laden air from by-passing the filter, an occurrence common with rigid frame filters. Made with components impervious to moisture, the poly ring air filter is excellent for rooftop units and HVAC units plagued with high humidity. Unlike other sprayed on tackifiers, the in-line tackifier does not come off in the air stream, landing on coils and other equipment. Each fiber is coated with the in-line tackifier to ensure filtering efficiency. The polyester media is thermally sealed around a heavy duty internal wire frame. A thermal seal around the center support wire prevents the filter from ballooning during operation. The open fibers on the air entering side, capture the larger dust, allowing the smaller particles to be captured by the tackified layer. Only the air leaving side has a unique, non-migrating, in-line tackifier that is bonded into the filter fibers allowing maximum use of the fibers upstream.